Treat yourself to an exceptionally memorable river cruise on the vast Mekong Delta of Southern Vietnam. Tour routes and activities’ details are for reference only. Final confirmation will be sent upon booking. Our boats leave from Can Tho to Cai Be on odd dates (e.g. Sept 3) and from Cai Be to Can Tho on even dates (e.g. Sept. 4). Daily departures. If you are staying in District 1 or District 3 of Saigon, we will pick you up as well as take you back to your hotel after the Mekong Delta cruise tour ends. 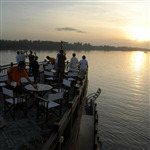 Join us with Mekong Eyes, you’re promised to experience an exclusively wonderful holiday trip. Treat yourself to an exceptionally memorable river cruise on the vast Mekong Delta of Southern Vietnam. Tour routes and activities’ details are for reference only. Final confirmation will be sent upon booking. If you book via an agent, please contact your agent for the final confirmation of tour routes and activities. On this tour you have more time to discover the sights of the Mekong Delta and enjoy the river life. You can visit two famous floating markets of Cai Rang and Cai Be. On several land excursions you have the chance to see local handicraft production, colorful brick kilns, opulent orchards and peaceful villages. Take an excursion with a small rowing Sampan or a short bike trip to explore the small side canals of the mighty Mekong river.This Mekong Delta river cruise is available with the wooden cruise vessels Mekong Eyes (14 cabins), the exclusive Dragon Eyes (2 cabins) and the private house boat Gecko Eyes. Our boats leave from Can Tho to Cai Be on odd dates (e.g. Sept 3) and back, from Cai Be to Can Tho on even dates (e.g. Sept. 4) and back. Daily departures. If you are staying in District 1 or District 3 of Saigon, we will pick you up as well as take you back to your hotel after the Mekong Delta cruise tour ends. Steve Mueller first moved to Vietnam in 1998 and it didn’t take long for him to fall in love with the multitude of vintage Vespas that were present in the country. He bought his first vintage Vespa for 300 dollars and hasn’t looked back since then. 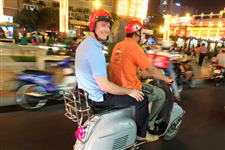 In 2007, Vietnam Vespa Adventures was formed and began to offer unique and exciting tours throughout the city. Our goal is to provide our customers with luxury, unique and authentic services and tours that exemplify Asia and its culture. We offer unique, culturally immersive tours of Saigon on a daily basis, as well as multi-day packaged trips from Ho Chi Minh to Mui Ne and to Nha Trang. New exciting team building exercises designed for corporate clientele are also offered. With a management team that consists of members with long-term academic and practical tourism industry experience, it is understood how important intimacy and comfort is for a tour. Every tour is conducted on our vintage Vespa motorbikes and is personalized to cater to the guests’ needs and comforts with superior attention to detail. As our company motto states, we want our guests to have “The Ride Of Your Life“, and we stand by what we say. We strive to ensure that our guests visit different sites around the city that are off of the beaten tourist path, all the while making sure they have a wonderful time and the experience of a lifetime.